There’s something so regal, so stand-up-tall about flower sugars, lavender in particular. Purple is of course the most royal of all royal colors. With the new heir to the throne about to come on the scene, I thought of that baby more than once with all of the lavender around here. It’s not just the purple and the perfectly long and elegant lavender stems that give the sugar so much flair. It’s the sugar itself, powdery or granulated, organic or muscovado or turbinado—it’s all so crystalline, and even though my mind wants to veer toward snowy with it, I refuse to allow that. 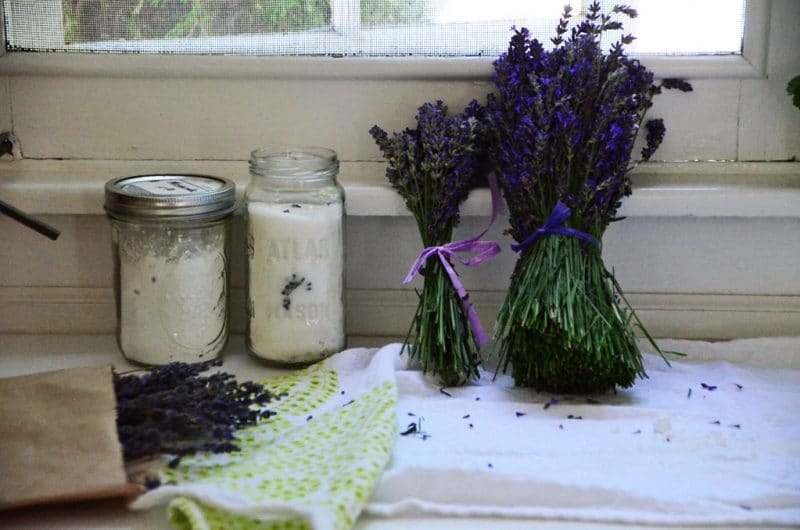 Instead I think sand, white sands and beaches and the scent of lavender on the farm where Mom and I picked our bunches, and here on the counter as it rests under the kitchen window now. 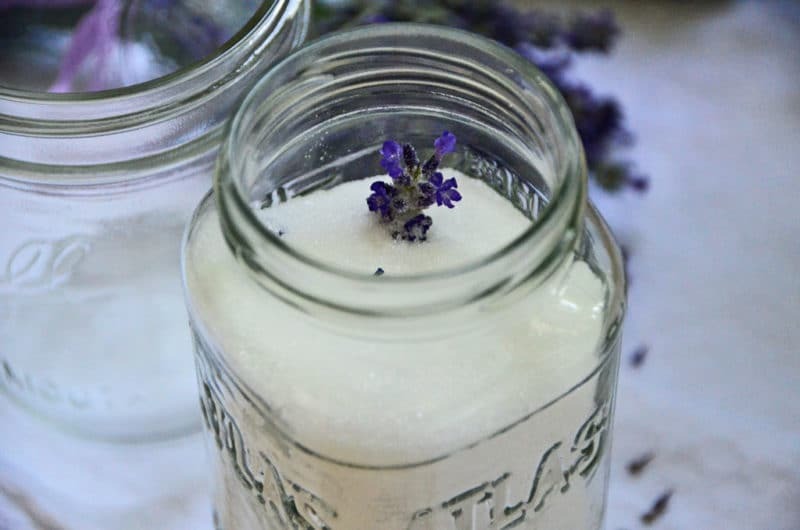 Why do you want to make lavender sugar? It’s a great way to impart a subtle floral lavender flavor in recipes like the one we’re baking this week (you’ll need a cup or so of both granulated and powdered lavender sugar). 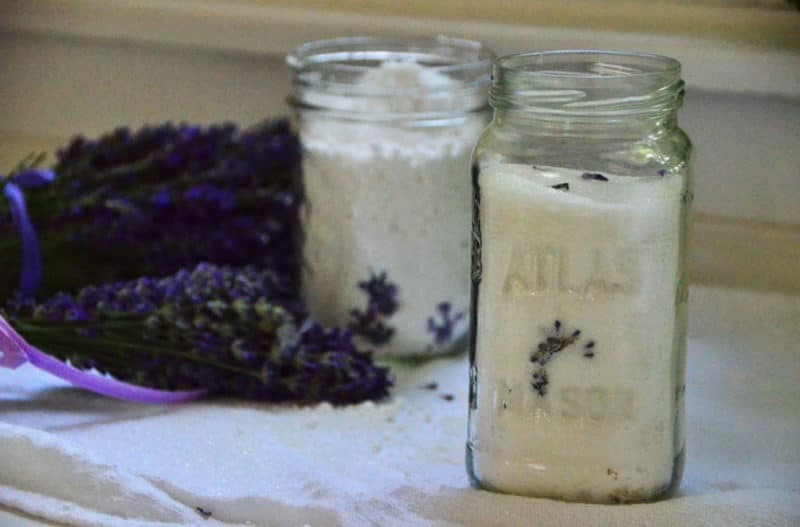 Use lavender sugar in teas, sprinkled over fruit, mixed into muffin or cake batter, or pressed into sugar cookies. Even whip lavender sugar into whipped cream or butter and spoon it onto whatever your heart desires. 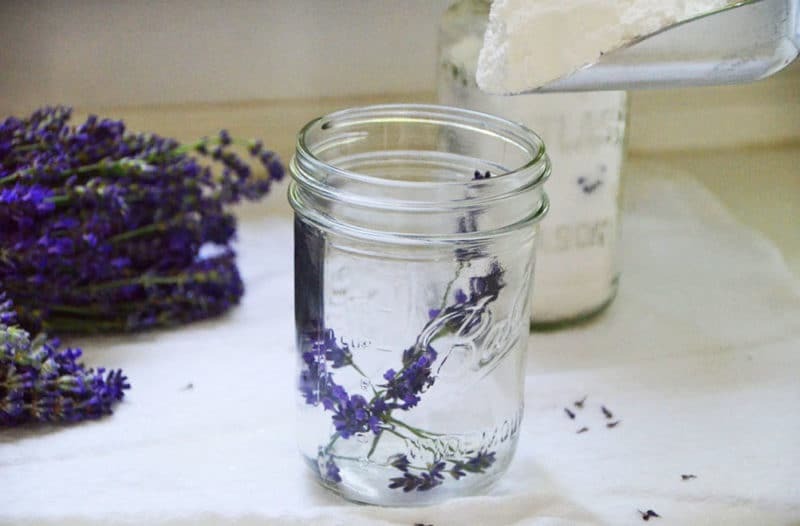 To make lavender sugar, use your favorite sugar with fresh or dried culinary lavender; for powdered sugar, dried lavender works best to prevent moisture and clumping. Be sure the lavender is one of the edible lavenda angustifolia, such as Munstead, Hidcote, and Royal Velvet (mine is Munstead). If not, the flavor will be too strong and camphorous and it will not taste good. 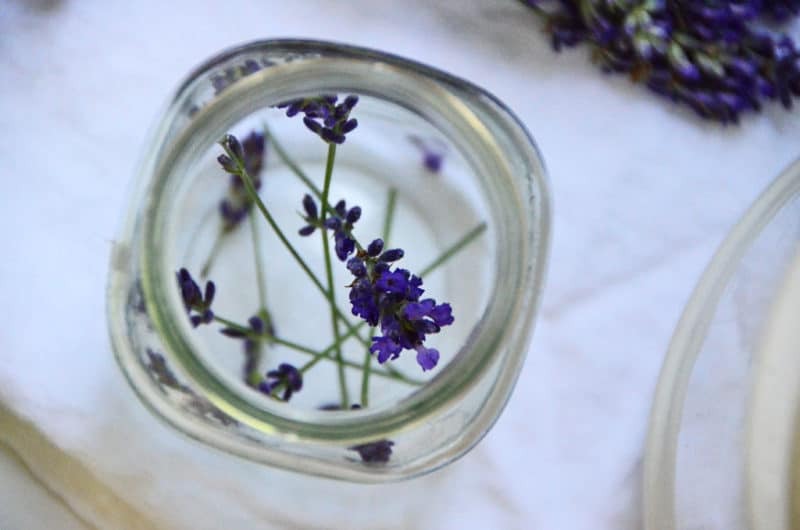 Dried lavender is much stronger than fresh, so use less, about 1/3 the amount of dried. How fragrant. How pretty. How delicious. 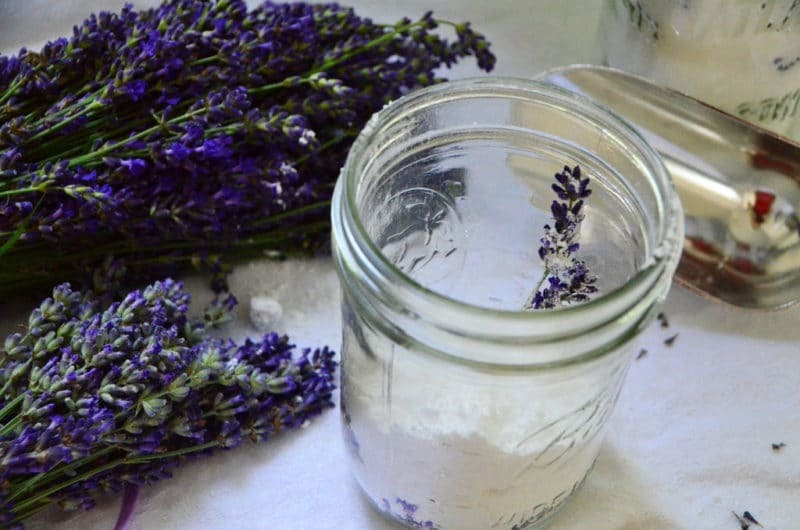 32 Responses to "How to make lavender sugar"
We use our lavender sugar for creme brulee, shortbread cookies, cupcake icing, etc.,and there is always a jar of simple syrup made with lavender in our refrigerator. It’s lovely in lemonade, iced tea, and a French 75, a favorite cocktail around here. I bought a small jar of lavender sugar at the Glen Arbor Farmers’ Market last summer. Now I have some ideas on how to use it! Hi Emma, and thanks for that question. I did not wash my lavender because I wanted it bone dry for the sugar. If you’d like to wash it, do that at least one day before making the sugar, and leave the lavender out to dry thoroughly. I use the purple little seed pod and that is what is sold at our lavender farm here, dried. Enjoy! Thank you! Now just need to ask my horticulturist husband what the varieties are that we have here in our garden! Your site is a great find. Getting ready to make lavender sugar for a church fundraiser. Saw some at fancy kitchen store in Charleston… idea was wonderful for fundraiser. Easy too. Thanks! Nice! Just curious, the jars you used are so cute. Can you let me know where you got them or the size? Hi Elynore, and thank you! Those jars are just some I’ve collected randomly; when I buy flowers up north, they’re often in these jars in summer. You can get the Ball canning jars all over the place, especially right now during canning season. I also love Weck jars. Your site was a great find for the recipe for lavender sugar which I need for a lavender cheesecake recipe. Our local lavender supplier grows both purple and white lavender and says the white lavender is better for food recipes. Do you use only purple lavender for edible recipes or do you also use white lavender? Thank you Bill! I’m interested in the white lavender but our local grower doesn’t sell it; I’ve only used the edible varieties of purple lavender. Your cheesecake sounds divine! I have made the lavender sugar,but it is absolutely rock hard,how do I rescue it,or can I rescue it? Carmel, did you keep the lavender sugar in an airtight container? That’s important, and also I found granulated sugar works better than powdered sugar for this. You might try heating the sugar on low heat for just a few seconds in the microwave to soften it. I had the same issue with my lavender sugar getting hard, even though I did keep it in an airtight, lidded bowl. But before using it, I pushed it through a strainer and it made itself back into granulated sugar, no problem. Hope this helps. Great tip Lynn, thank you! I’m looking forward to trying out this lavender sugar. Just waiting for my lavender. Haven’t cooked with this before. So it will be a new experience for me. It’s so wonderful…worth the wait! Thank you Anita! I’m interested in making the lavender sugar. I was wondering if places like Home Depot had edible varieties of lavender, or do I need to get it from somewhere else? Hi! Some big stores like that may carry the edible varieties but you’ll want to double check whatever variety they have to be sure. It may be more likely available at garden shops selling starter plants for more edibles. As a lover of all things lavender, and sadly a diabetic, I do have a question for you. Have you ever tried this with the granulated splenda, or other sugar free substitutes? Hi Carla–I haven’t tried this with sugar substitutes. I’ll be curious to know how it comes out if you do try it! Hi, 2 or 3 weeks ago, I tried making lavender caster sugar using 3 stems of flowered lavender from my garden with 2 cups or so of caster sugar. I rinsed the lavender under cold water, patted it dry with a paper towel and think I left it a day or so. I then put it in a clean screw topped jar that had previously had Morello cherries in it…..
A few days later, it was smelling lovely, then I forgot about it and this morning when I opened the jar some of the sugar had gone hard around the edges and it doesn’t smell like lavender. I think the sugar has a cherry taint to it concealing the lavender fragrance. Is there anyway I can fix this? I was originally going to bake shortbread with it. I am hoping I could fix it by adding either citrus zest or spices? Hello! Sounds like the sugar is still usable even if it’s not infused well with the lavender. I’m all for the citrus zest, lemon, for added flavor! 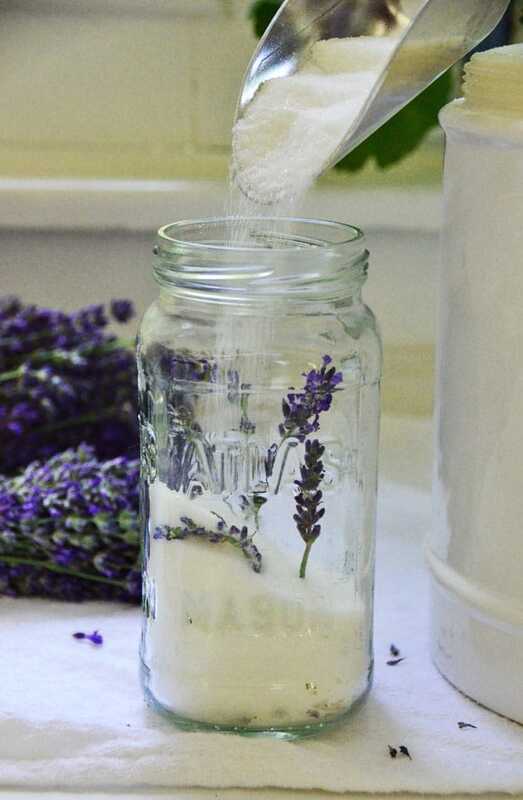 When using the lavender sugar in recipes, do you include the flowers or just use the sugar elements? It’s perfectly fine to include the flowers if that works with whatever it is you make with the sugar. I include it if the look of the flowers enhances the recipe, otherwise there is good lavender flavor without the flowers. I’m thinking of making these as gifts for a bridal shower or maybe the rehearsal dinner. I’m just curious if I could grind up the lavender, before or after adding it to the sugar to give it a better consistency. What a great and special gift! Yes, you could use ground lavender–I think it would be a bit of a different outcome, stronger lavender flavor and color. I sometimes mix a drop of lavendar essential oil (food grade) into a stick of softened butter to use in sugar cookies (& sprinkle lavendar colored sugar atop) – they look and taste great! What do you think about using just the oil in this way? Is it possible to use confectioners sugar? I want to try making flavored cocoa mixes as Christmas gifts, and lavender words very well with chocolate. Only I wasn’t sure if it would work. You can make the sugar with confectioners sugar but use dried lavender rather than fresh, which has too much moisture.